We know you can’t wait to witness the magnificent beauty of your new cast iron radiators. And we don’t keep you waiting. We can deliver your radiators in just 7 days (depending on the finish required). How is my delivery organised? When you place your order we will acknowledge your order and offer you an ‘available from’ delivery date which you can confirm from that date onwards on a day that best suits you. Deliveries are made on any day of the working week. Deliveries are made through the pallet network and delivered to the nearest accessible external hard standing. Their movement thereafter is over to your labour. It is possible to request morning or afternoon deliveries which are usually available in most areas but this does cost extra. Please also consider access issues for a large lorry (18 Tonnes) and if you think there may be access issues request the smaller lorry option of 7.5 Tonnes. Call us on 01205 280354 or email us to discuss and place your order. For our Paladin Colours metals range delivery is just 7 days for all other Paint Effects it’s 14 days and for Polished radiators it’s 3-4 weeks. We offer a reliable UK delivery service through the UK Pallet Network. This delivery service is usually without charge for all orders over £1200 (excluding VAT) delivered within mainland Britain although some remote geographical areas may incur some extra charges. We also offer worldwide deliveries on an individually priced basis. For orders with a value below £1200 (excluding VAT) a delivery charge of £65 (excluding VAT) applies. How will my radiators arrive? Your cast iron radiators are delivered individually wrapped with each individual radiator layer separated with a thick card then secured flat onto the pallet(s). 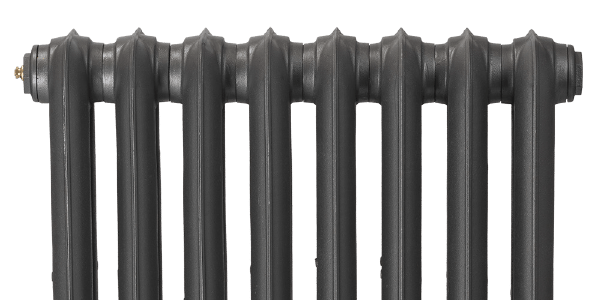 There is a length limit of 1200mm where the radiator would overhang the end of the pallet and in these instances the radiator is delivered in two or more pieces for re-assembly on site (by others), full instructions are provided. All Paladin radiators are fully pressure tested to 6 Bar ready for installation. Any valves or accessories are supplied loose. Download our delivery and installation guide opposite, or call us on 01205 280354 to discuss your individual requirements. If you would prefer to collect your cast iron radiators from us, then we can arrange for you collection from our workshops in Lincolnshire. An appointment is necessary before collection so we have your order prepped and ready to go. What about worldwide delivery options? We export hundreds of shipments per year of cast iron radiators all over the world, as far as Australia, New Zealand, America, and Europe. From Châteaux renovations, new builds, renovating period properties, castles and palaces, we have provided cast iron radiators for many exciting projects abroad which include projects for Royalty and Hollywood stars. We also have agencies operating in many countries that can help you on a more local basis. Most shipments abroad are shipped by sea but smaller items can leave via international courier services. When ordering for abroad, once we know the size and weight of your order, the Paladin Sales Team will provide you with a shipping quotation and advise on a lead time for the delivery usually this is provided on a door to door service basis. We try and make your international delivery service as easy as possible. Call us on 01205 280354 or email us to discuss prices for your cast iron radiators and shipment options. How can I take advantage of Paladins sales offers? If you are planning your installation some months ahead and wish to place an order to take advantage of any sale prices, we can store your order and deliver it in time to coordinate with your installation.